Things got out of hand in Pittsburgh today when Pirates starting pitcher Chris Archer took revenge in the 4th inning for a home run he had given up earlier in the game. Archer threw a fastball that went behind Reds 1B Derek Dietrich on the first pitch of the at-bat. Dietrich hit game-winning home run in seventh against Pirates on opening day and celebrated the home run with a fist pump and got a curtain call. Dietrich blasted a home run in the second inning to give the Reds a 2-1 lead Sunday. Dietrich appeared to be showboating and Archer was having none of it although he would claim it wasn’t intentional following the bench clearing brawl. 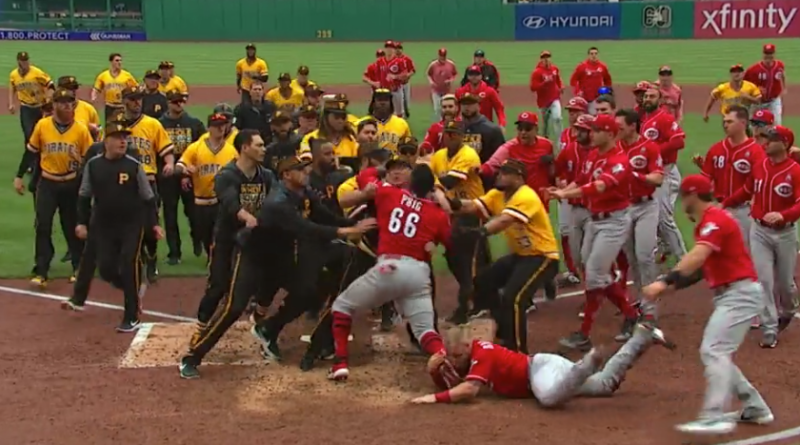 As the scuffle ensued Reds outfielder Yasiel Puig likely entrenched his name in Reds folklore after he escaped teammate Joey Votto’s grasp and challenged the entire Pirates roster. Puig will likely face a suspension from Major League Baseball. Manager David Bell and Amir Garrett were also ejected from the Reds’ side and Felipe Vazquez and Keone Kela were tossed from the Pirates.